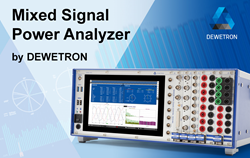 Introducing DEWETRON's DEWE2-PA7 Mixed Signal Power Analyzer- analysis of up to 12 power channels simultaneously, calculation of power parameters up to 7 phases per power group, gapless recording and high-performance power calculations - all from one device. The only Power Analyzer of its kind in the industry. Where there is power analysis there is DEWETRON. DEWETRON is pleased to announce the launch of the DEWE2-PA7 Mixed Signal Power Analyzer. Analyze polyphase electric vehicles and engine behavior with only ONE system and a guaranteed basic accuracy of 0.01 %. A DEWETRON DEWE2-PA7 is the solution for the simultaneous analysis of several motors, converters, or complete drive-trains – up to 12 power channels and the DEWE2-PA7 is the ONLY power analyzer with the capability to calculate power parameters, even polyphase motors, up to 7 phases per power group. Multi-phase systems have several advantages when compared to conventional three-phase systems: reduction of amplitude and increasing the frequency of torque pulsation, reduction of rotor-harmonic-currents, reduction of the current phase without increasing the phase-voltage-level, lowering dc-link-current harmonics and increased reliability as the analyzer continues to run even if one of the phases is open or short circuited. Waveform data, mixed signal and power analysis? A DEWE2-PA7 combines both while providing reliable, gapless recording of any analog or digital signal and high performance power calculations of several power groups simultaneously. Up to 2 MS/s/ch and high dynamic range guarantees data integrity. Dedicated measurement displays with classic power analyzer layout provide critical data values at a glance. A predefined measurement display for each user defined group of power channels presents an overview table, vector scope and harmonic chart. Different styling presets and data presentation tools are available to tailor the display to your exclusive needs. Analysis of harmonics, interharmonics and higher frequencies as well as voltage fluctuations and flicker emissions are measured per to industry standard. The 9” high resolution display is very bright for maximum readability with ample space for user defined screens. The few required settings are easily accessed with just a few swipes on the multi-touch display. Accessible and orderly arrangement of signal inputs and power parameters directly on the front. Everything at a glance! DEWETRON’s OXYGEN™ with Power software seamlessly integrates data being transmitted through multiple, totally synchronized signals into calculations for power analysis. Where there is power, there will be power analyzers. Where there are power analyzers, there will be DEWETRON.